Huawei Honor 9 latest version update is now available. Today we share B170 Honor 9 STF-L09 Update For Europen variant device. This version is rolling out via OTA on your device but if you don’t get any update via update app and want to update. Then you flash this full firmware and directly update the B170 update for Honor 9 STF-L09 firmware. The ROM packs with Android 7.0 Nougat which based on EMUI 5.0 OS. The Honor 9 is having 5.1 HD screen. Best is the 1080p resolution in this device. It has a display of pixel 1080 by 1920. It Comes with the Kirin 960 processor. Packed with 6GB of ram. The Honor 9 is having storage 64GB internal. Expanded 256GB by using the external SD card. The camera of Huawei Honor 9 is 20+12 megapixels at the rear. 8 megapixels at front. Runs on the Android 7.0 Nougat OS with EMUI 5.1 skin. It has the best battery of 3200mAh capacity. Lasts up to 5-6 hours on continuous usage from a full charge. The smartphone has two sim slots. The connectivity, has 4G, Bluetooth Wifi, OTG support. Honor 9 is packed with almost all sensors. Like Proximity sensor, Accelerometer, Ambient light sensor etc. This firmware work only Honor 9 STF-L19 B170 Europen/Russian/Middle East variant, do not try other version devices. This update improves system security with Google security patches. [Optimizations] Improved device security with Google security patches. Many users do not get this update on their device via updater app, so if you want to update your device, then you are the right place. Here the guide and B170 ROM link for Honor 9 STF-L09 version. First, unroot of your device and then follow posted flashing method. 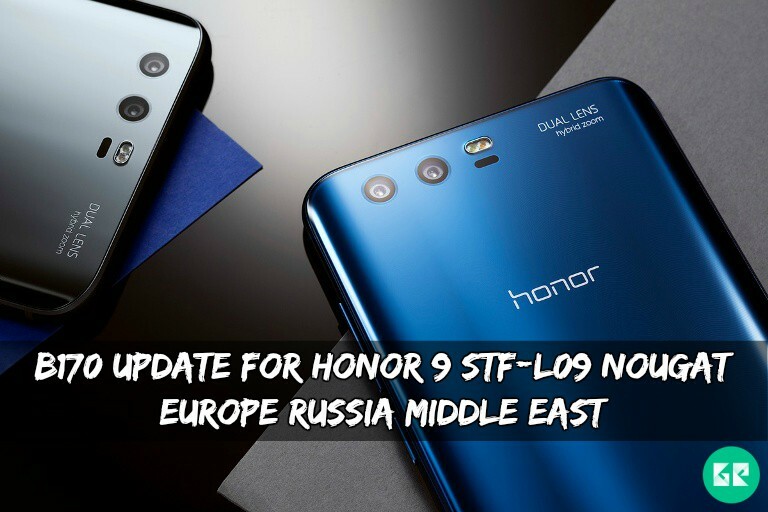 B170 update For Honor 9 STF-L09 for European/Russian/Middle East variants. The build number is STF-L09C432B170/STF-L09C10B170/STF-L09C185B170. If you are new in this process then, please first read the following step. Download all the files according to your device model and copy it to phone memory. Then flash the second and third firmware file.